A Saxon church set apart from its village, beside a Georgian manor house. The oldest part of the church is the north door, now blocked up, which predates the Norman Conquest. The door has a carved tympanum that may date to an even earlier building on the site. The north wall itself has been dated to around AD 1000. Evidence of the ancient origins of the church is further emphasized by the fragments of Roman bricks that can be seen in the buttresses and walls. A number of early Norman carved stones were reused in the making of the walls. 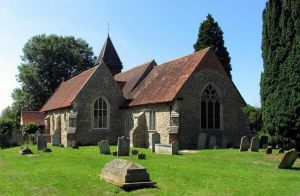 >The bulk of the remainder is 14th-century work, with a 15th-century turret. The church is built to a very simple design, with a short chancel. Excavations under the east end revealed the possible existence of a Saxon church built of timber, with a rounded apse. Within the simple interior is a royal coat of arms dating to the 17th century, a bit of rare survivor. There is a Georgian gallery and Victorian woodwork, a variety of 17th and 18th-century slab memorials, and an Elizabethan wooden chest.